This content is an excerpt and a free pattern from Euphoria Tapestry Quilts by Deborah Kemball. In a way, this is the anomaly in my repertoire. I like to try to give all my flowers some sense of movement and flow, but here is a couch potato of a flower, sitting serenely on its background color—no stalk, no movement in its leaves. I have to confess a predilection for water lilies, with their waxy leaves, their magical opening and closing with the sun’s wax and wane, their long lives, their beautiful shades of color, and their enticement for dragonflies. 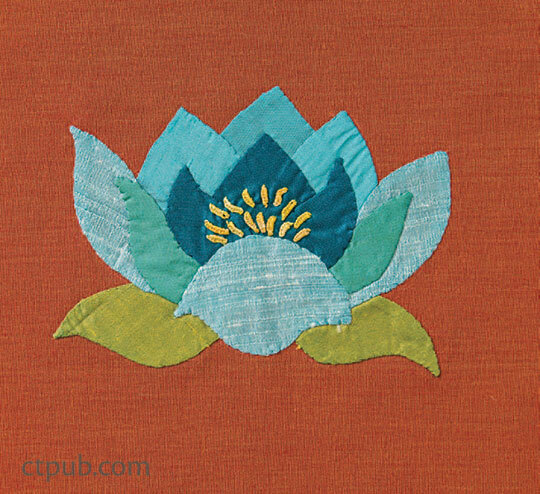 It’s all about the order of appliqué for the water lily. Because it is not a hard flower to appliqué, I like to use four or five shades of a single color for the whole flower, favoring turquoises, pinks, lilacs, whites, and yellows. I prefer using the darkest shades for the middle petals J, K, and L and the lightest shade for the front petal M. I also like to embroider lots of stamens, sometimes just using detached buttonhole stitches as shown below and sometimes connecting those stamen heads with stamens. You can download the pattern here. 1. 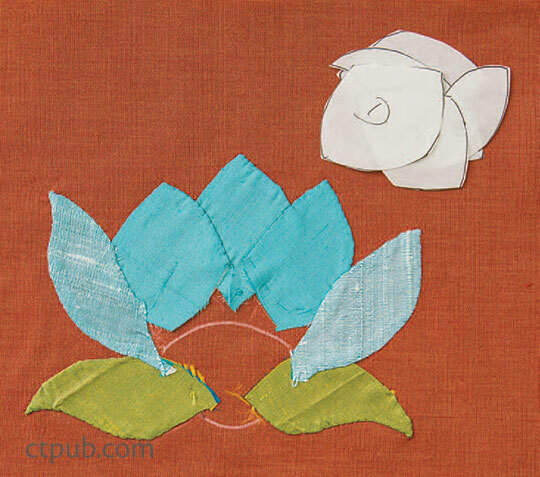 Appliqué A and B in green for the base petals. Follow with C, D, and E in a middle or light shade. Follow these with F and G in either your lightest shade or a middle shade. These form the back of the crown. 2. The placement lines on the background will now be covered, so use your pattern to estimate the positions of H and I; then baste them into place before appliquéing. Use another middle shade for these 2 petals. 3. 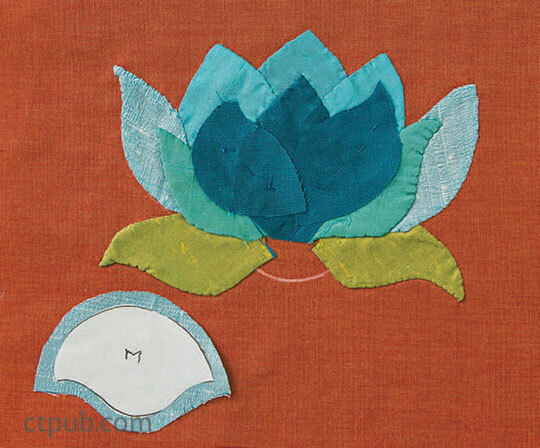 Use your pattern to place and baste the dark central petal J before appliquéing. Repeat this step with petals K and L.
4. Snip the inner curves on front petal M for nice curves on each side. Appliqué in place, covering the raw edges of the petals. 5. Embroider lavishly with stamens! 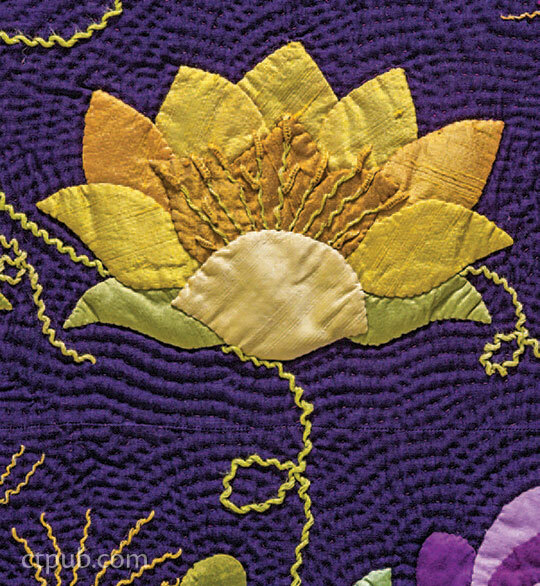 Check out Euphoria Tapestry Quilts HERE!